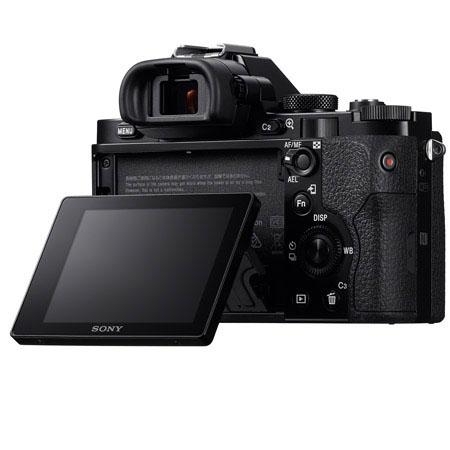 Sony's Exmor image sensor takes full advantage of the Full-frame format, but in a camera body less than half the size and weight of a full-frame DSLR. 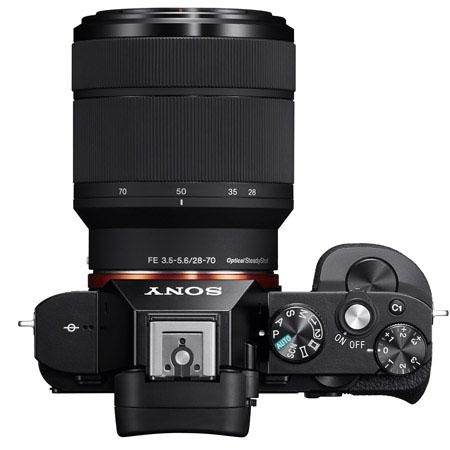 A whole new world of high-quality images are realized through the 24.3 MP effective 35 mm full-frame sensor, a normal sensor range of ISO 100 25600, and a sophisticated balance of high resolving power, gradation and low noise. The BIONZ® X image processor enables up to 5 fps high-speed continuous shooting and 14-bit RAW image data recording. Enhanced Fast Hybrid auto focus combines speedy phase-detection AF with highly accurate contrast-detection AF, which has been accelerated through a new Spatial Object Detection algorithm, to achieve among the fastest autofocusing performance of any full-frame camera. First, phase-detection AF with 117 densely placed phase-detection AF points2 swiftly and efficiently moves the lens to bring the subject nearly into focus. Then contrast-detection AF with wide AF coverage fine-tunes the focusing in the blink of an eye. The high-speed image processing engine and improved algorithms combine with optimized image sensor read-out speed to achieve ultra high-speed AF despite the use of a full-frame sensor. Even when capturing a subject partially turned away from the camera with a shallow depth of field, the face will be sharply focused thanks to extremely accurate eye detection that can prioritize a single pupil. A green frame appearsover the prioritized eye when focus has been achieved for easy confirmation. EyeAF can be used when the function is assigned to a customizable button, allowing users to instantly activate it depending on the scene. 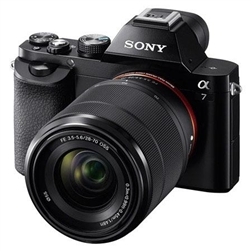 To take advantage of the lightweight on-the-go body, the 7 is fully compatible with Sony's E-mount lens system and expanded line of E-mount compact and lightweight full-frame lenses from Carl Zeiss and Sony's premier G-series. Quick Navi Pro displays all major shooting options on the LCD screen so you can rapidly confirm settings and make adjustments as desired without searching through dedicated menus. When fleeting shooting opport u nities arise, you'll be able to respond swiftly with just the right settings. View every scene in rich detail with the XGA OLED Tru-Finder, which features OLED improvements and the same 3-lens optical system used in the flagship a99. The viewfinder faithfully displays what will appear in your recording, including the effects of your camera settings, so you can accurately monitor the results. 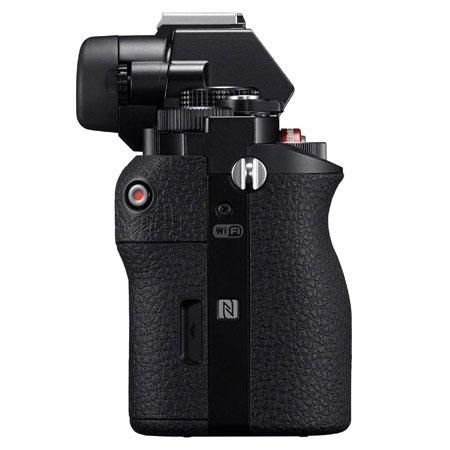 You'll enjoy rich tonal gradations and 3 times the contrast of the a99. High-end features like 100% frame coverage and a wide viewing angle are also provided. The tiltable 3.0" (1,229k dots) Xtra Fine LCD Display makes it easy to photograph over crowds or low to capture pets eye to eye by swinging up approx. 84° and down approx. 45°. Easily scroll through menus and preview life thanks to WhiteMagic technology that dramatically increases visibility in bright daylight. The large display delivers brilliant-quality still images and movies while enabling easy focusing operation. Connectivity with smartphones for One-touch sharing/One-touch remote has been simplified with Wi-Fi®/NFC control. In addition to Wi-Fi support for connecting to smartphones, the a7 also supports NFC (near field communication) providing "one touch connection" convenience when trans ferring images to Android smartphones and tablets. Users need only touch devices to connect; no complex set-up is required. Moreover, when using Smart Remote Control a feature that allows shutter release to be controlled by a smartphone connection to the smartphone can be established by simply touching compatible devices. Remote Camera Control allows you to control your a7 from your PC using a USB cable. Feature control has also been updated to include video capture control. 14-bit RAW image data of extremely high quality is outputted by the a7. This data fully preserves the rich detail generated by the image sensor during the 14-bit A/D conversion process. When developed with Sony's Image Data Converter RAW development software, these images deliver the superb photographic expression and rich gradation that only 14-bit data can offer. Capture Full 1920 x 1080 HD uncompressed clean-screen video files to external recording devices via an HDMI® connection in 60p and 60i frame-rates. Selectable in-camera AVCHD codec frames rates include super-smooth 60p, standard 60i or cinematic 24p. MP4 codec is also available for smaller files for easier upload to the web. Unlike conventional cameras, the a7 features the advanced Multi-Interface Shoe that dramatically expands compatibility with Sony digital imaging accessories, thus raising the potential for photo/movie shooting. Enjoy Ultra High Definition slide shows directly from the camera to a compatible 4K television. The a7 converts images for optimized 4K image size playback (8MP). Enjoy expressive rich colors and amazing detail like never before. Images can be viewed via an optional HDMI or WiFi. TRILUMINOS Color technology, allows you to experience photos and movies in rich, natural colors on any TV equipped with a TRILUMINOS Display. The expanded color gamut immerses you in those unforgettably colorful moments, from the complex shades in a shimmering blue sky to the delicate skin in a baby's face. Advanced features enable manipulation, conversion and management of full-resolution RAW images. You can expertly adjust exposure, white balance, tonal curves, saturation, contrast, hue and sharpness as well as apply DRO and vignetting compensation. Bundled Remote Camera Control software also lets you remotely activate and deactivate still/movie recording and control various camera settings from a PC.